FILE - Khieu Samphan, left, former Khmer Rouge head of state, and Nuon Chea, Khmer Rouge's chief ideologist and No. 2 leader, sit in the court room before they made closing statements at the U.N.- backed war crimes tribunal in Phnom Penh, Oct. 31, 2013. The U.N.-backed war crimes court trying the two surviving leaders of Cambodia’s Khmer Rouge regime heard its first day of evidence on Monday on the charge of genocide. The tribunal last year found Khieu Samphan and Nuon Chea, the two former leaders, guilty of war crimes and crimes against humanity, a ruling that both men have appealed. Monday’s hearing marks the presentation of evidence in the prosecution’s effort to prove the much more difficult charge of genocide – the first time in the court’s nine-year history that it is hearing testimony on that alleged crime. But the charge of genocide does not refer to the mass killings of ordinary Cambodians, the ethnic Khmer who constitute the majority of the country’s population during the Khmer Rouge’s brutal 1975-79 rule, and who comprised the majority of its victims. Instead it relates specifically to the regime’s actions against two minority groups: ethnic Cham Muslims and ethnic Vietnamese. Simply put, Olsen said, genocide refers to having the intention to eliminate in part, or in full, a group of people based on their race, religion, ethnicity or nationality. FILE - Cambodian court officer Neth Pheaktra guides students outside the court hall before appeal hearings against two former Khmer Rouge senior leaders, Khieu Samphan and Nuon Chea, at the U.N.-backed war crimes tribunal in Phnom Penh, Cambodia, July 2015. “Clearly in this context of Cambodia where the majority of the Cambodians who were killed during the Khmer Rouge regime were killed by Cambodians with the same ethnicity, simply the traditional legal definition of genocide would not include these kinds of acts," he said. The Khmer Rouge’s persecution of ethnic Cham Muslims and ethnic Vietnamese, the prosecution said, does fit that definition, and on Monday the tribunal heard testimony from It Sen, a 63-year-old Cham farmer. Sen told the court that after the Khmer Rouge took control of his area in eastern Cambodia in 1973, they barred residents from practicing their religion and customs – even their language – on pain of death. The Khmer Rouge’s persecution of the Cham Muslims, a distinct ethnic group with their own customs and religion, has been well documented. The Khmer Rouge regarded the Cham as enemies, and dealt brutally with them. Large numbers of Cham Muslims, were murdered. 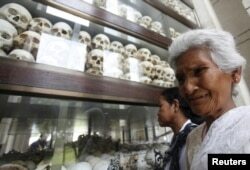 In one district, the Khmer Rouge arrested and killed every Cham villager. In 1975, Pol Pot told cadres to force Cham Muslims to raise pigs and eat pork, and said those who refused must be killed. The Khmer Rouge destroyed and desecrated mosques, burned Korans and sacred texts, and executed Cham leaders. Most Cham who were not killed were dispersed, forcibly married into other communities, and barred on pain of death from practicing all aspects of their culture. By the time Pol Pot’s regime was overthrown in early 1979, it is thought that one-third of the pre-regime Cham population, which numbered about 300,000, were dead. Sen, who was ordered out of his village in 1975, was one of the few from his village to survive. His wife and child did not. FILE - A woman cries in front of the skulls and bones of more than 8,000 victims of the Khmer Rouge regime during a Buddhist ceremony at Choeung Ek, a "Killing Fields" site located on the outskirts of Phnom Penh, Cambodia, April 17, 2015. During his testimony, he spoke of witnessing a daylong massacre of his fellow Chams, dozens of whom were roped together at a time, the rope attached to a boat, and the prisoners dragged into the center of the river. Sen managed to escape the house in which he was being held, and swam downstream to safety. The prosecution contends that what happened to Sen and his fellow Chams constitutes genocide, as were the actions taken by the Khmer Rouge against Cambodia’s ethnic Vietnamese minority – which also included mass deportations and killings. By 1979, Cambodia’s ethnic Vietnamese population had been nearly eliminated. More witnesses are scheduled to testify in the coming weeks. This second mini-trial of the two surviving leaders is likely to last into 2016.